This post has been brought to us by Mark Merchant and George Vafiades of As One Effect. Check them out on BooyaFitness.com. 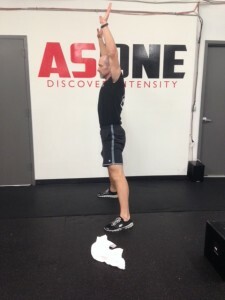 Ah, the burpee – one exercise that requires, mobility, flexibility, strength, systemic conditioning (full body fitness), core and shoulder stability – love the burpee. 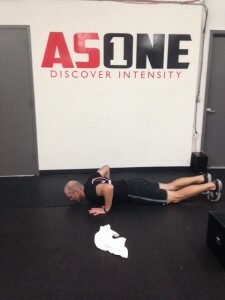 The burpee is an integral part of the As One program so, if you’ve taken class, you certainly know how to do this. But, if you, or a friend, want to come in and check out a class, this is a perfect way to get ready. 2. Bend over to the ground with your hands down. 3. Jump your feet back as you lower your chest to the floor. 4. Press up and in one motion jump your feet back to starting position. 5. While standing up, jump up with your hands over your head. Eager to try the burpee (aka squat thrust)? All of our bootcamp workouts feature the move! This entry was posted in Fitness Tips and tagged boot camp workout, bootcamp, burpee, fitness, fitness boot camp, fitness tips, fitness workouts, how to on June 4, 2014 by TeamBooya.